Directed by Dieter Dorn, this Munich Opera production of Idomeneo is the latest in a series of provocative stagings of the young Mozart's first mature opera seria. There is something about this youthful work, with its unprecedentedly high dramatic stakes and scope, that seems to incite extreme responses, but whereas earlier interpretations such as the 2003 Deutsche Oper Berlin production (cancelled in revival in 2006 in light of the Mohammed cartoons controversy) or Peter Sellars' and Anish Kapoor's Bush-era production for Glyndebourne Touring in 2003 explored the work's politically radical elements, this new production is more interested in the aesthetics of the opera. Composed when Mozart was just 24, the work bears the stylistic and structural influences of Gluck and Metastasio's reforms of opera, particularly in its psychological development of character and use of French-style arias and accompanied recitatives. Yet the uncharacteristically prominent chorus presence and integrated ballet sections are pure Mozart, and signal the exploratory and experimental aspect of this early work – we see the young composer attempting to move away from rigid set-piece structures into a more fluid drama, essaying techniques that would appear in refined form in the later operas. This original social and artistic context of the work provides ample justification for the experiments of any contemporary director, and it's an invitation that Dieter Dorn here takes up enthusiastically. The production is set at a characteristically postmodern double remove from its audience; the main action and drama takes place in a Cretan setting that evades any particular era with its generically colourful peasants and robe-wearing dignitaries. This action however is placed within a secondary framing device, one that blurs the distinctions between stage and backstage areas, characters and landscape, and Eastern and Western locations. 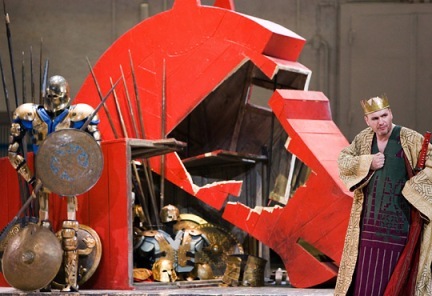 Throughout the opera we are aware of the stripped-back stage space of the set, exposed in all its grimy contemporary reality complete with radiators and stage clutter, and as the action continues and the pillars and thrones of Crete collapse this second frame breaks through increasingly. This is a portrait of a world in flux, a nation in the aftermath of the Trojan War that finds itself with its ethics and identity still somehow unfinished and under construction. It is a clever approach that adds greatly to the sense of human fragility and uncertainty that pervades the opera, but one that loses its potential impact in the fussiness and complexity of its working-out. There is a compulsive avoidance of stillness throughout – which in an opera with more than its faire share of contemplative and interior arias feels unnecessary and distracting – as well as a refusal to trust in the musical drama of Mozart's scenes to do its work without the rather literal support of physical action. Particular casualties of this over-directed approach are the wronged Electra's rage aria 'D'Oreste, D'Aiace' where her inner turmoil of abandonment is unnecessarily literally enacted in the attacks and cavortings of the Ninja warriors (used throughout to signify acts of fate), and also her Act I aria 'Tutte nel cor vi sento', in which the Furies she invokes are all too willing to appear in their bloody and glassy-eyed glory. The acting of the cast as a whole is notable for its nuanced naturalism, which sits in rather awkward counterpoint with the symbolist set-design; full advantage is taken of the predominately close-up filming approach, and each aria and recitative moves through a series of emotional mini-episodes, rather than favouring the primary coloured block emotions suggested by Varesco's rather ungainly libretto. Pavol Breslik in particular as Idamante gives a hugely moving performance, taking us with equal conviction through the tentative and gentle wooings of the captured Ilia, and the uncomprehending pain of his father's rejection. Vocally too Breslik is well suited to the lyrical role, exposing surprising fullness of tone in arias such as 'Il padre adorato' that adds welcome colour and scope to his interpretation. The role of Idomeneo is a challenging one vocally, but even more so dramatically – hinging as it does on an oath of sacrifice that is freely given, and thus all the more difficult to accept and justify. John Mark Ainsley is a skilled actor, and brings all his flexible lyricism to bear here. In his hands the luckless monarch becomes a touchingly and weakly human character, and his Act III recitatives are masterclasses in control and the emotive deployment of vocal technique. The pairing of Juliane Banse (as Ilia) and Annette Dasch (as Electra) is an effective one. The rival women are set in direct opposition throughout the work and require very distinct characterisation if they are to succeed dramatically. Banse's interiority and understatement provide an effective foil to the histrionic outpourings of Dasch, and while Banse is the more vocally consistent of the two (and gives a beautifully delicate performance of 'Zeffiretti lusinghieri') it is Dasch who takes the soprano laurels in her stunningly agile 'D'Oreste D'Aiace'. Musically this production is a triumph, with Kent Nagano's brisk tempi and controlled orchestral sound providing the backdrop for a dynamic cast, both solo and chorus. Dramatically however it lacks cohesion, and at times the direction actively impinges upon the opera's musical elements. The constant motion and physical activity – both foreground and background – is distracting, and at times seems to conflict with the dramatic instinct of the singers. 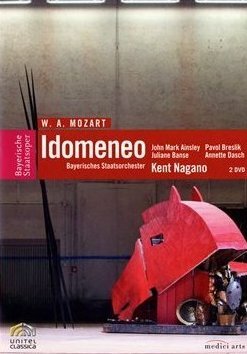 Thus while a live recording of this production would be a welcome addition to the Idomeneo recording canon, as a DVD it sacrifices audio clarity without gaining the dramatic impact that the additional visuals should provide.